The Blaine is a 6-inch tall men's boot with a simple and sophisticated black leather exterior. The antique brass non-tarnishable hooks and eyelets and heavy duty laces are crafted for durability. It has 5 Iron Texon® insoles that allow for a relaxed and comfortable fit and the Dri-Lex® technology delivers heightened comfort through a moisture management lining system that is totally breathable and quick drying. The fiberglass shank offers stability and this boot features a Vibram® outsole that provides maximum traction on wet or dry surfaces and various terrain. Made in the USA with global parts. This was my first pair of Chippewa boots, I've bought several more pairs since getting these. These boots are very comfortable, the leather is soft and break in was practically instant. I love the logger outsole and the insole is very comfortable with a nice arch support. I've been wearing these now for about a month and love them. Love the speed lace hooks, but wish the top eyelet was also speed hook. I just lace up the the top hooks and leave the top eyelet unused, no problem, the boots are still snug on my feet. 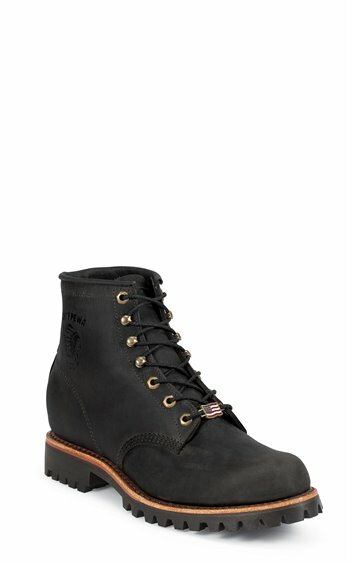 I wanted some high quality made in the USA boots, so I tried Red Wing and Wolverine before trying Chippewa. They all make great boots but the Chippewas just fit my foot better than anything else. Have had a pair of these for 2 years - the most comfortable boot for everyday use that I've ever owned! Sized perfectly. I use Nor-v-gen oil on them and then Kiwi black to keep them looking good. I where them to work and out and about during colder months. Very comfortable out of the box. I have neuropathy and these boots were comfortable the first time I wore them. The only downfall was that the right boot structure broke down in less than a year. I did buy a second pair and hope for longer wear. I bought a pair of these excellent and well-made boots a year ago, and am very happy with them. I bought them to wear during the winter, especially when there is ice or snow on the ground. But I found the boots to be so comfortable and good-looking (the tan leather part of the soul looks nice) that I have prolly worn them 3 days a week for a year, and they are still almost new condition - wearing like 'iron'. The Vibram black waffle-stomper sole is long-lasting and grippy. I am now shopping here for another style and color of boot made by Chippewa. This boot is very much worth the moderate cost. Like the simplistic style. Really wished it was an all blacked out boot. Very little break-in time. Comfortable. Made in the USA. Will wear when riding my motorcycle. These are the best boots I've ever owned. They are comfortable from the start and are really well made. Chippewa is now my preferred brand and these in particular are my favorite. I always wanted a pair of Chippewa boots. The moment I put them on I knew I would be buying them. I am a classic 10D and the 10D size fit like it was build around my foot. Thank you for continuing to make these great boots in the USA. I get compliments on them all the time and people ask me who's boots they are.